Following the Russian annexation of Crimea in 2014, there were fears that Estonia and Latvia could be dragged into a similar crisis due to the large numbers of ethnic Russians living in each state. But as Michele E. Commercio highlights, the unique history of Estonia and Latvia has produced a very different situation to that in Ukraine, with both states now hosting a new generation of integrated, bilingual ethnic Russians who are content with their lives in Estonia and Latvia. Any attempt to integrate parts of Estonia or Latvia into the Russian Federation would likely face fierce resistance from ethnic Russians on the ground as well as from NATO forces. Russia’s annexation of Crimea in 2014 generated grave concerns in the international community regarding Putin’s potential further ambitions, particularly toward the Baltic States. This apprehension was the foundation of NATO’s decision to beef up its military presence in Estonia, Latvia, and Lithuania. Yet Putin has made no effort to ‘integrate’ these states, or heavily Russified parts of these states, into the Russian Federation. The most obvious reason for this is the fact that all three Baltic states are members of NATO; Ukraine, of course, is not a member of NATO. But there is another seemingly simple but significant reason Putin will not try to integrate these states into the Russian Federation: he is cognisant of the fact that such a geopolitical move would be too difficult because ethnic Russians in Estonia, where they are 25% of the population, and Latvia, where they are 26% of the population, are content. They have no desire to join the Russian Federation. Indeed, they would resist an attempt at integration, and NATO would support the territorial integrity of the sovereign states in which they reside. The assertion that ethnic Russians in Estonia and Latvia are satisfied with the status quo requires further explanation. 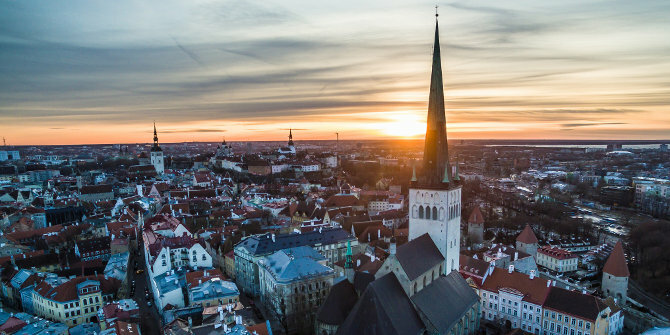 When Estonia and Latvia became independent sovereign states in 1991, they embarked on nationalisation projects designed to strengthen and promote the Estonian and Latvian nation politically, culturally, demographically, and economically. This is hardly surprising, given the traumatic history of each nation, which we can characterise in terms of deportation, occupation, and illegal annexation. Following the illegal incorporation of the Baltic States into the Soviet Union in 1941, Moscow pursued an aggressive Russification policy that included outsourcing ethnic Russian labour to these states to ensure political stability, cultural conformity, and economic reliability. The policy resulted in a demographic imbalance that rendered Estonians and Latvians a bare majority within their respective union republic. It also generated asymmetric bilingualism, as Russians were monolingual while out of necessity Estonians and Latvians were bilingual, mastering Russian for practical purposes while attempting with difficulty to keep their native languages alive. Aggressive Russification also ensured an ethnic Russian or heavily Russified Estonian/Latvian political leadership that advanced Moscow’s interests at the expense of local interests. By the end of the 1980s, Russification policies had spawned a pervasive fear of cultural extinction among Estonians and Latvians that motivated elites to pursue the most aggressive nationalisation policies implemented in the post-Soviet states. Although it has waxed and waned over time, particularly as the European Union pressures member states to abide by the Framework Convention for the Protection of National Minorities, Estonian and Latvian nationalisation included at one time or another, for example, citizenship laws that granted automatic citizenship only to individuals who were citizens of the respective interwar republic. Given the massive influx of ethnic Russians into the Estonian and Latvian Soviet republics after WWII, this meant that most ethnic Russians residing in independent Estonia and Latvia were not granted automatic citizenship and had to naturalise if they wanted to belong to the polity. Naturalisation policies were linked to cultural preservation attempts, as they required applicants to pass Estonian/Latvian language tests. Another example of Estonian and Latvian nationalisation resides in language policy: Estonian and Latvian are the state languages of Estonia and Latvia respectively; all other languages, including Russian, are designated foreign languages. In addition, knowledge of the state language is a standard requirement for public sector employment. Estonian and Latvian nationalisation could have generated conflict between ethnic Russians on the one hand and Estonians in Estonia and Latvians in Latvia on the other hand. But this has not happened because elites in these countries have devised what I call a system of partial control, in which the majority ethnic group controls the political sector but shares control of the economic sector with minority ethnic groups. The citizenship and language policies discussed above have, over time, ensured firm Estonian and Latvian political control over independent Estonia and Latvia. Consolidation of political control has enabled Estonian and Latvian elites to permit economic access to the system without opposition from staunch anti-Russian Estonian and Latvian nationalists. Working under the assumption that economic prosperity would give ethnic Russians a stake in the system and thus discourage conflict, Estonian and Latvian elites opened the private sector to Russians after they had secured political control. Excluded from the public sector in the 1990s and early 2000s as a result of citizenship and/or language policy, ethnic Russians established businesses in Estonia and Latvia’s flourishing private sectors. Economic stability, and in some cases prosperity, along with EU and NATO membership, discouraged Russians from leaving Estonia and Latvia and from protesting nationalisation policies in these countries. Indeed, it encouraged them to take advantage of available economic opportunities, naturalise, and raise their children bilingually. The end result is a new generation of integrated, bilingual ethnic Russians who are content with their lives in Estonia and Latvia. Were Putin to unwisely attempt to ‘integrate’ Estonia and Latvia, he would face fierce resistance from ethnic Russians on the ground as well as NATO forces there to defend the integrity of these independent, sovereign states. Michele Commercio is an Associate Professor of Political Science and the Director of Russian, East European Studies at the University of Vermont.